2018 Road Course World Champions beat out drivers from around the world and race regularly at New Hampshire Motor Speedway. The Road Course World Finals brought a great group of racers from as far as Sweden, Finland, Latvia and Canada to Las Vegas Motor Speedway, but it was the United States - New Hampshire, more specifically - that came out on top in every division. All of the INEX point championships given in the road course discipline came out of the Granite State Legends program at New Hampshire Motor Speedway. "The MOAT Mountain Legend Car Road Course Series is one of the most competitive road racing series in New England by far," said Tom Blanchette, executive director of the MOAT Mountain Road Course Series and director of operations for New Hampshire Motor Speedway. "It has created opportunities for racers to pursue careers as road course racers and instructors at premier venues around the world, and we are ecstatic to have all of the World Road Course Champions hail from our series at NHMS. It would not be possible without our long term series sponsor, MOAT Mountain Pub and Brewery from North Conway, N.H. Stephen Johnson and his team are great to work with and also are champions in the craft beer market in New Hampshire." Shaun Buffington was able to lock in the Masters points championship in his first season in the division with 16 season wins and a third place finish at this year's World Finals. Bob Weymouth took the Golden Masters points championship after more than 15 years in the legend racing program and continues to be a great supporter of the program. Jordan O'Brien now holds the Pro International points title for the second year in a row with 11 wins, inducing two wins at Anglesey Racing Circuit in Wales. Carter Weedon took home the Semi Pro points championship, ending his season with 34 top ten finishes. 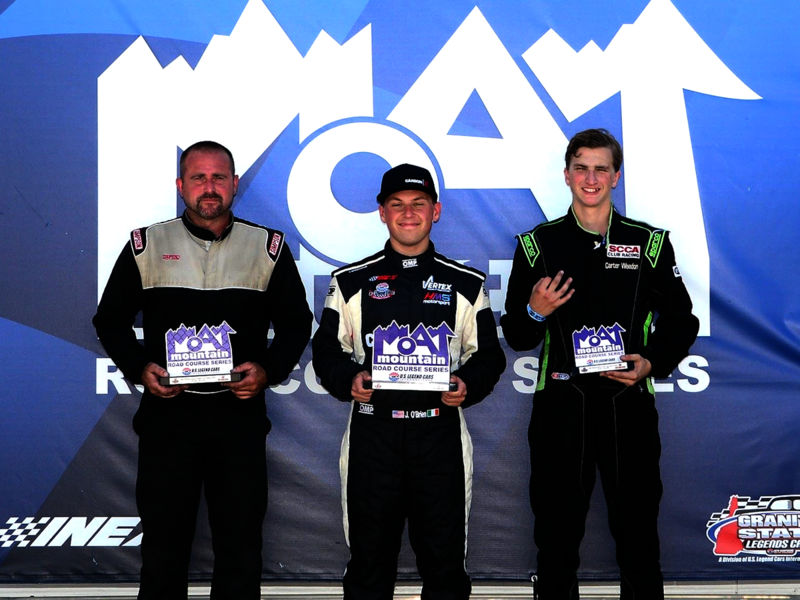 In the most novice division, Matthew Gaudreau took the Young Lion Road Course points championship for the second season in a row. Gaudreau spent his last season as a Young Lion with 25 top ten finishes, giving him a stout lead over the rest of the field. The Granite State Legends crew not only finished on top, but was dominant throughout the entire points field. Drivers like Thomas Saari, Kevin Girard Jr., Jack Walker, Christopher Hines and Michael Hines rounded out the top ten in their respective divisions. "What more could I ask for," said Kelsie Leonard, Granite State Legend Cars supervisor. "To be able to say all of the 2018 World Champions are part of the Granite State Legends Program is pretty cool. I'm looking forward to seeing them all back here next season and hoping to expand the program with some new faces in 2019. We have our annual holiday party coming up, and that's the perfect way for a new driver to get started while saving some money." The Granite State Legends Shop will be hosting its annual holiday party-themed sale on Saturday, December 8 from 5:00 - 9:00 p.m. The sale includes 20 percent off all apparel or buy one get one 50 percent off, 15 percent off all G-Force racing gear, 10 percent off all Legend and Bandolero car parts and 10 percent off Legend car chassis with sheet metal. Attendees can also enjoy complimentary food and drinks. For ticket information for events at New Hampshire Motor Speedway, including the Gift of Lights, Nov. 23 - Dec. 31, visit the speedway website at www.NHMS.com or call Fan Relations at (603) 783-4931.